Lansdale, inspiration for the Ugly and the Quiet American. Edward Geary Lansdale, 79, a retired Air Force major general who spent most of his career as a counterinsurgency specialist in the Philippines and South Vietnam, where he developed the doctrine that communism could best be defeated by "winning the hearts and minds of the people," died of a heart ailment Feb. 23 at his home in McLean. Gen. Lansdale was an influential and often controversial figure who helped shape U.S. policy in Southeast Asia at critical junctures during the 1950s and 1960s. He was an assistant for special operations to secretary of defense Robert S. McNamara during the early years of the Kennedy administration when vital decisions were being made to commit U.S. support to the Saigon government in fighting the Viet Cong in South Vietnam. As special adviser to the Philippines defense minister, Ramon Magsaysay, he directed the successful campaign against the communist-led Hukbalalhap guerrillas during the early 1950s. Re: Ed Lansdale, prototype of the "Ugly American"
the Brando part is not the same as the one based on Landsdale in the book. Interesting watch but boy, that narrative is so loose with the truth. You have to see and hear the film's Diem character, it's Thai's Paul Lynde. Also, who would the king be representing who visits the country, LBJ? I have no idea. Did you know that there was attempt on Macnamara's life in 'Nam? Don't ask me the courageous young man's name who almost made it but you might like to look it up. Unless your ultra curious, I would pass on the interview below, for me I learnt next to nothing. It's complex history that would take, at least for me, some research... also, out of all of this, the Peace Corps was initiated. The Kennedy Administration is known for that. The book caused a sensation in diplomatic circles, and had major political implications. The Peace Corps was established during the Kennedy administration partly as a result of the book. It was one of the biggest bestsellers in the country, has been in print continuously since it appeared and is one of the most politically influential novels in all of American literature. Lansdale did have some of the "love for the common people" in how he operated, this is so. He felt that to win against an enemy, say the Communists for example in the Philippines, you have to win the heart of the people. Maybe I can expand on this later. In Vietnam, "the communists" were the people. That's why we instituted the client regime because winning a fair election was just not going to happen. That same regime was killing Buddists for years( the vast majority of ordinary people were Buddist), it's only when it gained so much publicity with the priests that we started to worry about it. Brando going off on his old freind because he thinks he's turning commie on him is probably one of the better scenes but the whole premise is just so ridiculous. Forming a free society where a country is allowed to use it's resources to benefit it's own people and trading with anyone it likes is not something that can be tolerated, that's the real threat to the US, that's our problem with Cuba, Vietnam and many, many others in a nutshell, we forced them to turn elsewhere because true democratic societies are no benefit to us, that's why we don't have one and never will. I believe we are familiar with this or some of this but the truth is before Vietnam was the Philippines whose government had to battle insurgent communist guerillas as well in the Hukbalahap. This may well be why the book by Max Boot on Lansdale is called "The Road Not Taken" and why the point of contention is whether Vietnam might have turned out better if it had been run more like the Philippines. Buddhism is not even a very big religion I would think in the Philippines, so a much different situation. So, Vietnam was different and Boot and apparently, Steve Forbes, Forbes magazine, seem to argue that Lansdale should have been listened to more per that war. This story appears in the February 28, 2018 issue of Forbes. The Road Not Taken—by Max Boot (Liveright, $35)—is a brilliant, extremely well-written book about a forgotten figure who was one of the most extraordinary and utterly unorthodox espionage agents in history, and it contains a telling scene that encapsulates what went tragically wrong with the Vietnam War. The operative, Edward Lansdale, was visiting President John F. Kennedy's defense chief, Robert McNamara. The former president of Ford Motor, McNamara profoundly believed that everything could be managed by numbers (or what we today call "metrics"). McNamara had an IQ that could boil water, a personality that could freeze the tropics and a deep disdain for anyone he considered his intellectual inferior, which was almost everybody. Lansdale was given ten minutes--no more!--to advise McNamara on how the U.S. should deal with the growing communist insurgency in South Vietnam. The allotted time was a harbinger of how the meeting would go. Lansdale was a man well worth listening to. In the 1930s he'd been an advertising man in California, where he demonstrated a real knack for writing and a firm grasp of the psychology involved in the art of persuasion. In WWII Lansdale ended up in the Office of Strategic Services (OSS), precursor of the CIA, which was run by the legendary William "Wild Bill" Donovan. This fish had found his water. After the war he moved into the newest branch of the military, the Air Force, which served as cover for his overseas activities. (Even late in life, he was loath to acknowledge he'd been in the CIA.) Lansdale soon found himself posted in the Philippines, which was facing an increasingly powerful communist uprising called the Huk Rebellion. The Filipino government and military were responding in ways that were fueling the insurgency, especially by killing numerous civilians in the fight against the rebels. Lansdale quickly grasped that these kinds of responses to a skillful guerrilla enemy, one that also employed effective propaganda, was a formula for a bloody defeat. Two of the more craziest things in my opinion. We train them to fight, to shoot, to hate and magically, to fly. goes and bombs Diem's palace. So sad. a US citizen, rather interestingly referred to as a Operative(or a word of that nature), anyone know more? The other is the French, the root of whole problem. They'd just been colonized for 4 years by the Nazis, giving them a great taste of what it feels like, just imagine it, controlled by the Nazis. Their first move after the dust from D Day settles is to do to others what the Nazis did to them. Of course it was wrong to help them Ed, couldn't have been more wrong. Lastly, who is that giving him a medal in the photo behind Ed which has pride of place for the interview? Yes, no prizes for guessing, only the biggest warmonger of his generation. ^For his work with and settling in Diem correct? Around '56? Tricky hadn't even gotten his pants off yet but yes. Also Richard, I did just watch one of Max Boot's book talks on Ed so thanks for the heads up. Max is easy to listen to which always helps, pehaps a wee bit conformist but what can you do? I'm not 100% sure which medal Lansdale is receiving from tricky dicky. A couple of obituary write ups mention Lansdale was awarded two Distinguished Service Medals. Gen. Lansdale received two Distinguished Service Medals for work in developing counterinsurgency tactics in Vietnam and for services as adviser to Magsaysay in the Philippines. (Citation Needed) - SYNOPSIS: Colonel Edward G. Lansdale (AFSN: 2534A), United States Air Force, was awarded the Air Force Distinguished Service Medal (Army Design) for exceptionally meritorious and distinguished services to the Government of the United States, in a duty of great responsibility as Assistant to the Secretary of Defense in matters of great importance Indo-China during the period from 1954 to 1956. The singularly distinctive accomplishments of General Lansdale and his dedicated contributions in the service of his country reflect the highest credit upon himself and the United States Air Force. 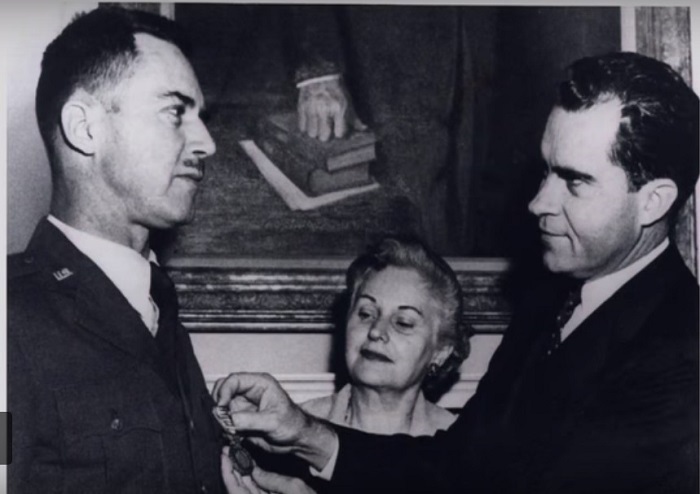 Seeing that picture of Nixon doing the 'honors' of awarding Lansdale his medal kinda brings it home how chummy Nixon & Lansdale's relationship probably was. You don't really see it mentioned by anyone, the relationship between the two. Nixon would have obviously been well aware of Lansdale's abilities for: 1. wiping people off the planet 2. being an expert Kingmaker.